The Genesis RoadTech Men’s Road Bike comes with an aluminium frame which makes the bike strong as well as light. The bike offers smooth ride quality which can be attributed to its fork. The fork does really well in absorbing the shocks off the road and provides a superior ride experience. It uses Shimano shifters which have a proven track record of performance and endurance and they allow smooth and seamless gear shifts. The alloy calliper brakes of this bike can bring the bike to a quick halt and allow precision braking with superior stability and control. The bike has a slick and stylish look which is definitely going to attract a lot of attention. This bike can be used for riding, exercising or commuting and it offers to you a complete package of performance, endurance and agility within a small budget. The Genesis RoadTech is equipped with Lightweight Aluminium Frameset; Shimano Revo Shifters; Shimano Derailleur; Alloy Caliper Brake Levers; Alloy Caliper Brakes; High-performance 700C Tires; Alloy Vitesse Racing Rims; Aloy Drop Bar Handlebar; Vitesse Racing Seat; Plastic Bodied Pedals with Steel Cage; 21 Speed Gear Range. The Genesis RoadTech is an entry level road bike which can be used for commuting, exercising or just riding along the city or town streets. The bike comes equipped with an aluminium frame which keeps it weight in check. 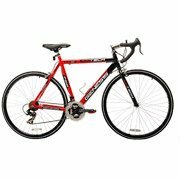 The bike is fairly light and easy to handle and the ride quality offered is smooth and enjoyable. The bike comes with Shimano components which offer seamless shifting and provide a wide gear range which makes riding easy in any kind of surface. The bike has a slick and polished look which makes it appealing. The bike does not ship assembled. Although assembling the thing is pretty easy and straight-forward, it is still quite some work if you are new to it. Make sure to take it to your local bike shop to set it up and get it tuned. The wheels that come with this bike are pretty ordinary and wear out very fast. You might want to buy a new set of wheels if you plan to ride hard. The pedals are also pretty low-end and the seat is not as comfortable as you would expect it to be. Changing the saddle and the pedals is also required if you want a comfortable ride experience. Overall, the bike performs well as a city commuter and offers a smooth ride experience coupled with speed, comfort and style. The bike is quite easy to handle and comes with an extremely reasonable price tag. If you are looking for an entry level road bike to get started with biking or a city commuter bike to get to work, this one can be a great choice.